This costume is perfect for any medieval event or even a storybook theme. 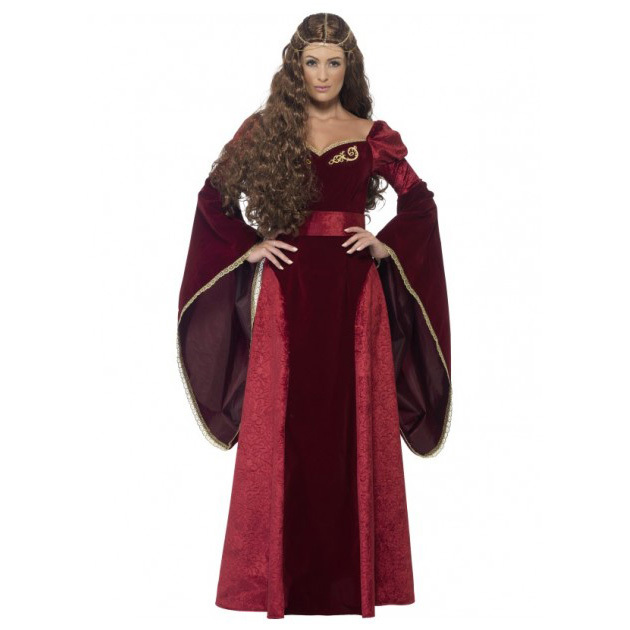 The fancy dress costume is made from a burgundy deluxe material with a contrast of red down either side of the dress, there is a red trim going around the waist, and long flowing sleeves to complete this gorgeous look. 3 Pc costume Includes: Deep red Velvet Dress with gold trim detailing, gold chain head piece, belt. Dress is fitted on bust and then flows out to a full length long gown. Red on gown, with flowing bell sleeves.